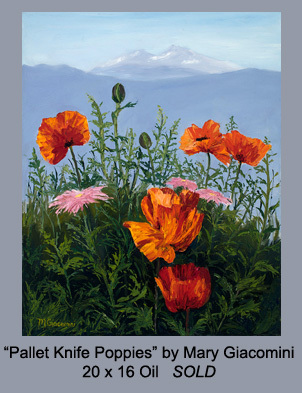 I currently teach two home studio classes for adults in Loveland, Colorado. I teach an Adult watercolor class on Wednesday mornings. This class is intended for beginners to intermediate students. No experience is necessary. I have a maximum of 7 students per class. We learn all kinds of new things during the year including color experiments, drawing lessons, value, composition, textures, types of paper, cropping, critique, themes, glazing, wet on wet, purple underpainting and much more. My goal is to teach my students how to achieve their goal of painting what inspires them. I am open to suggestions from the group for upcoming classes. I also teach a weekly oil painting classes out of my home studio on Thursday mornings. My classes are small with a limit of 6 students so everyone gets plenty of individual attention. I teach beginning to intermediate levels. One thing I do a bit differently is I teach safer methods of traditional oil painting without the nasty solvents. I have found much healthier ways of oil painting without the use of Gamsol Or Turpenoid. My goal as an art instructor is to teach you the basics of oil painting and how to paint your vision. I like to cover a variety of subject matter, techniques and styles that I've learned over the years. With my home studio classes I do request a one month at a time commitment. Many of my students choose to stay in the class for years. By teaching small classes I can help both the beginner with no experience to more advanced students. You can find more information on my blog. You can reach me at: 970-613-1258. Prints & cards can be ordered through Fine Art America.